It was this time last year that Ashlie made the decision to sign up for her first marathon. She knew she wanted to finish one at least once in her life, but she kept putting it off. She had a one and a half year old at the time, so she thought it would be a good time to train as it was between having kids and being in a pretty set routine. No such thing as a “convenient time” she learned. 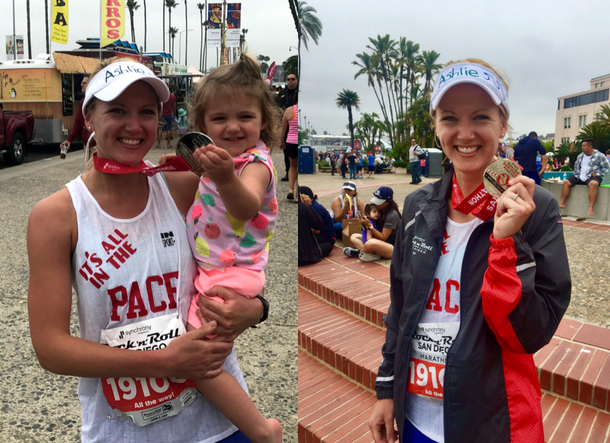 To provide some background, Ashlie was born and raised in Southern California and running was always a part of her life--running on the beach in ideal weather that is. So here she was signing up for a marathon that wasn’t until June but she needed to train between January and that time, so running in the Minnesota winter was her lot. To add to this, her husband is a resident here at Mayo Clinic, so his schedule is completely unpredictable and extremely demanding…aka, no free time. How was she going to manage working, teaching fitness classes, taking care of a one year old and training for a marathon? She commented, "I had to get some grit and become one of those crazy runners you see on the trails in the dead of winter...oh, you don't know one of those? Nice to meet you!" She may never have thought she would be training for a marathon in a Minnesota winter, but she also never anticipated living in the Midwest nor being blessed with such a great work community. All of this to say that this was so much more than a marathon for her. It was all about setting a goal, getting a little uncomfortable physically and mentally, relying on others’ support and being disciplined. This also was a learning experience for her to show herself grace and give herself permission when she needed it as well as lean on a community that wasn’t part of her home base. That community was the DAHLC for Ashlie. Since she works here at the DAHLC, the coaches gave her very wise training advice (shout-out to Chad, Shaun and Brent). Others provided moral support (Dani) and still others helped her post-marathon when she was experiencing a setback but wanted to stay fit (Andy).